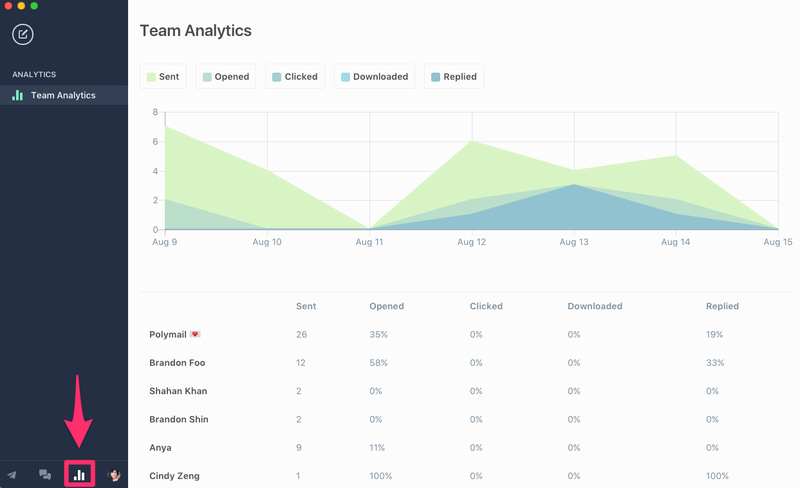 Polymail Team Analytics help you measure your Premium team's outreach and performance with a day-by-day analysis of how many messages your team sends, as well as your team's open rate, click rate, download rate, and reply rate. To access Team Analytics, click the Analytics tab in the lower left corner of our Web or Mac apps. If you're already on a Polymail Premium Team, you'll see a graph and table with your team members and statistics for your last week of usage. Sent refers to the number of new messages each team member has sent. We don't count replies to messages and we only take into account the emails that have been sent from team email address. Emails sent from a team member's personal email address will not be reflected in the sent tally. Clicked relates to emails containing links. If you send an email containing one or more links in it, we will count the email as "clicked" if your recipient clicks at least one link in the message. Downloaded similarly relates to emails containing attachments. If one of your recipients downloads an attachment from your message, it will show up here! Replied indicates that an email you've sent has received at least one response from at least one recipient. The graph you see above the chart breaks these statistics down on a day to day basis so you can see which day saw most emails sent, opened, etc. If you interested in some categories more than others, you can always disable specific categories so you only see the ones you want. Team analytics are available on our Polymail Premium tier only. If you'd like to learn more about Polymail Premium, check out our article here!